Obviously I do not believe any of these lies. I've struggled periodically throughout the past several years with a couple of different types of mental illness. I wholeheartedly believe that mental health is 1000% real. I've lived it and felt completely helpless as to why I couldn't just snap out of my funk. Or why I was suddenly overcome with anxiety and panic when I was in a room of friends and/or family. I've lived it and I always empathize with others when I hear they are struggling with some form of mental illness. I've mentioned before how I had a pretty rough year last year. Physically, I kind of crashed. My days were a constant struggle to keep up. Most days it was a struggle to just stay awake. Let alone get anything done. I think it was July when I finally made a doctor's appointment to go talk to someone about how bad I was feeling. Long story short, I found out I had Hypothyroidism, and my Anemia was getting worse and worse. "Great", I thought. Now I have answers and treatment for the struggles I was having. I can finally start feeling better, stop trying to fall asleep behind the wheel, and maybe even start to be able to remember things and keep my thoughts straight. The thyroid meds helped a good bit, but the iron was not getting better. By Thanksgiving I was barely able to function at all. I remember sitting on the sofa on Thanksgiving and just crying because I felt so bad. I literally felt like just a blob of goo sitting there. I remember thinking, "I'm so sick of myself." I was just so OVER feeling like crap all the time. Things were definitely better! But something was still missing. I was still having a terrible time remembering even the smallest things. Having trouble keeping my thoughts straight. Struggling to focus on my work and get things accomplished in a reasonable amount of time. And never, never was I ever able to sit down and edit a complete session from start to finish in one sitting. I was constantly distracted and bouncing around from tab to tab on my computer. I would EVENTUALLY get things done. But it took me soooo much time to finish up even the simplest tasks. It was becoming super frustrating! Over the years, I always chalked up my procrastination and inability to get things finished, to my own personal inadequacies. I have sat down time and time again and made lists, plans, bought organizational systems, and set goals, for how I wanted to run my business. Or how I wanted to organize or clean my home. Or, "This year I'm going to enjoy the holidays because I'm not going to put things off until the last minute." I'd plan things out, but I was never able to follow through and get things done efficiently. Once again, I went back to the doctor and said, "My memory is getting worse and worse. Sometimes it's scary how bad my memory is! And I cannot focus on anything and get it done when I need to." I figured it might have something to do with my Anemia or Hypothyroidism. Because both of those conditions have affects on your brain function. Or, the fact that I never sleep well. Even though I'm always exhausted and sleepy, I never can fall asleep at night. And then even if I do fall asleep, I wake up a million times. He gave me some sleeping pills to try, and a written test to take. I can't take sleeping pills because they make me feel drowsy and groggy for about 48 hours after I take them. That grogginess, combined with my already foggy brain, not a good solution. Anyway, as I'm going through this questionnaire he gave me, I found myself marking yes to nearly all the questions. It was an assessment for ADHD. I was shocked! Never had it ever crossed my mind that I might have ADHD. After all, I don't have a hyper bone in my body. I am perfectly capable of sitting still and doing nothing for long periods of time. ☺ I had the stereotypical perception of ADHD in my mind of a hyperactive little kid running around being rambunctious when I thought of ADHD. Based on that assessment, he sent me on for a Quotient ADHD computer test which came back with a resounding positive diagnosis. Shocked, but also relieved to have some answers, I started taking ADHD medication. Turns out, all of the various struggles I've been having for years weren't just my own lack of motivation and self discipline. My brain just functions way differently than a typical brain does. So WHY do I feel called to share all of this about my own health? 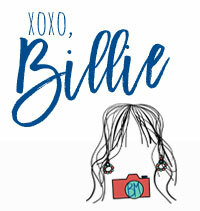 Jill Hayes - Great post, Billie. Thanks for sharing.